The Mireya from the UGG® Australia Adella collection features a classic sandal silhouette combined with unexpected softness. 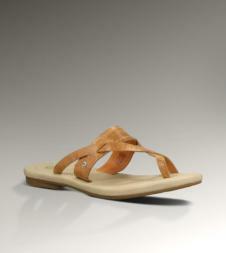 Heavily cushioned footbed and fully leather lined uppers satisfy both comfort and style requirements for all day wear. The luxury leather straps feature a 7mm antique metal UGG® logo rivet.